Canning has been a theme the past few weeks so I’m excited to share these free printable canning labels with you. 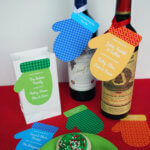 It all started with a canning night from iheartcrafting, a Chicago ladies’ crafting group. Hostess Lisa bought large boxes of lovely blueberries, fresh green tomatoes and flavorful apricots from a local farmer’s market. We all pitched in jars, lids, pots and labels and canned enough blueberry jam, apricot jam, and pickled dill green tomatoes for each of us to take home five canning jars. Next up: Northern Michigan. I brought these canning labels as a hostess gift for my friend Jennie. She’s been learning all about canning, including raspberry freezer jam that needs no boiling …so much easier and no boiled fruit. So now that you’re properly in the canning mood, let’s get to the labels! 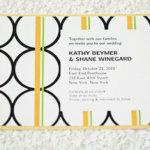 These labels were inspired by the cute label designs by Kendra at A Sonoma Garden. You’re more than welcome to use this printable canning label template for free with the request that anyone using this template or design post a comment below. And if you’d like to use Kendra’s original canning labels, be sure to check out A Sonoma Garden. Visit my etsy store for cheap and lovely personalized canning labels that YOU can personalize yourself and print year after year. Kathy’s free canning template (PDF – printed with blueberry jam, strawberry jam, salsa, relish) or Kathy’s free blank canning labels for you to handwrite your own (PDF) OR visit my etsy store for personalized canning labels that you can type into and print out yourself, year after year. 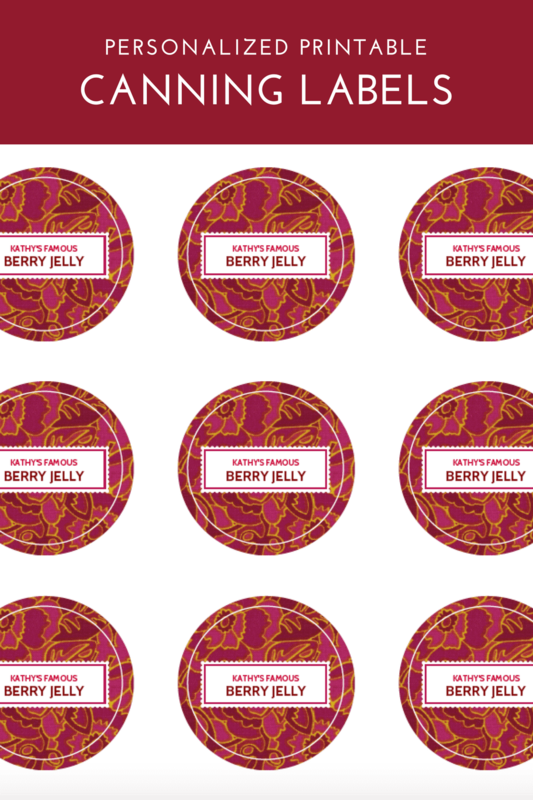 Download one of my free canning label templates (pre-typed with blueberry, strawberry, salsa and relish or blank for you to hand-write). 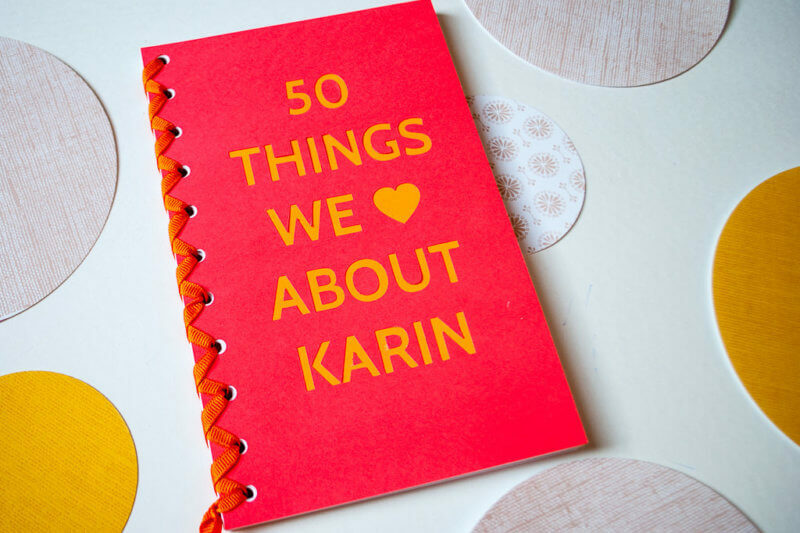 Visit my etsy store if you’d like to customize your own creations by typing into an interactive PDF (which will give you typed personalized labels rather than handwritten ones). My etsy store labels are sized to fit Avery Print-To-The-Edge 2″ Round Labels (products 22807, 22817, 22825, 41464, 41494). 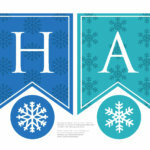 Print onto full-sheet sticker paper using a laser color printer. No laser color printer? FedEx Office can print them for you very cheaply. 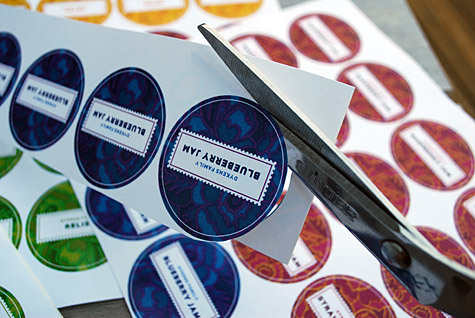 Using your 2-inch hole punch or scissors, cut out the labels. Peel off the label backing and stick on top of the lid of your canned goodness. Also be sure to check out my striped modern canning labels in red, blue, yellow and purple and my easy raspberry freezer jam recipe. Be sure to pin my printable canning labels for later. Love it! A friend of mine is doing jam as part of a wedding favor so I’ll be sure to send this to her! Thanks. I was lucky enough to receive a few cans of this delicious jam. And I mean delicious! These are beautiful! Makes me want to can, just so I can use the labels. I may just label a bunch of other things, too. These are darling! Thanks so much for this, I’ll be linking. Thanks a lot!! 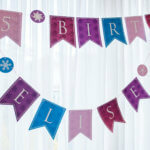 I am going to use these labels too! these labels are great. thanks!!!!! I love these labels! I’ve been fighting with the Avery site designing my own with its clip-art, but these look more modern and unique. Beautiful! These are beautiful! I’ll link to you in my new blog post about great sites to get free downloadables. thank you for sharing! 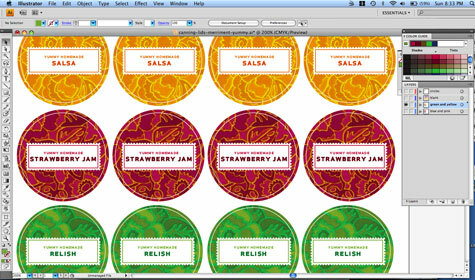 I’m using the file to create labels for my Christmas presents- raspberry jam. My very first canning project! I love your design! I downloaded adobe illustrator and signed up for the one month trial, so I can customize the labels as you said. However I cannot download the source file…I have tried several times and it just hangs up and will not load. Do you have any suggestions, or can you email it to me? Saving this for summer when fruit will be plentiful and I can make some gifts. The labels will make them all the more special. Thank you! Hi, just letting you know I will be borrowing these for my own personal use! Thanks, they’re beautiful! Thank you! Just perfect especially for all the jam I make!! These labels are really great! I’m attempting to download and use for summer canning missions. Many thanks! Thank you! I am going to use these if I can ever get the download to work. I think have it figured out!! Thank you, they are beautiful! This is just what I’ve been looking for! Thanks for the tips on how to create my own. I love the colors you choose – you could easily match the color to the content. Wonderful template – I am using them for my wedding favours and I think they’re going to look fabulous! Hi Ash, you can edit the text by clicking the text tool …it looks like a “T”. Then click on the text you want to edit and go from there. If you need to move anything around, click the solid arrow tool, then click what you want to move to activate it, and you can either move it with your mouse or arrow keys. Does that help? Thanks for visiting! Thanks for these cute labels! I just made the first jam of the season-strawberry and strawberry-lemon marmalade. So beautiful! I made pickles for the first time ever from some cukes my in-laws grew this week. Your labels are perfect for pickles! These are perfect for my freshly filled jam jars! Thanks! Thanks, Chari! How did the personalization work out? I’m going to print them for my fresh batch of rhubarb jam! Thanks! Nice, Jamie! Let me know if you need to borrow any sticker paper. Thanks! I’m going to use these for canning salsa later this summer. My tomato plants are already 5 feet tall and growing. It looks like I’ll have a really good harvest this year!! Ah, Linda, the salsa sounds great. I’m jealous about your tomatoes. Sadly, our tomatoes this year are about 2 feet high. Here’s hoping for warmer Chicago days ahead …we’ve certainly been getting plenty of rain! Thanks for the inspiration! I can’t imagine why I’ve never thought of scanning in an image to use on my labels. I’m going out to take photos of my raspberry bushes. They’ll be the perfect background for my raspberry jam label. Too bad I didn’t see this before I spent the afternoon stripping the bushes of all the ripe berries. Oh well, there will be more in a few days. Thank you! I’ve spent the better part of the afternoon Googling for canning labels and being disappointed at all the country/kitschy options. These are lovely, sophisticated and exactly what I’m looking for. Bravo! Thanks, Stephanie! I was kind of in the same situation which is why I ended up making these myself, so I’m glad that you could use them too! Such elegant labels – thanks so much for offering these. I’ve used them to label jams and sauces I’ve canned so far, & am waiting until the tomatoes are in season when I will no doubt have to print dozens. I’ve also shared this link with myFarmgirl friends over at Maryjanesfarm. Thanks again. Hi Jennifer, glad that you could use them! And thanks for telling me about Mary Jane’s Farm. That’s a new one for me. I live in the city but would love to grow food! Love the lables! Want to dress up my jars for the fair. Can’t get the, downloaded. Bummer. Thanks for the labels! I love the design you chose. Can’t wait to use them to label some peach jam and kosher dills. I absolutely love these. I have just made about 50 jars of jams. Can I hire you to make me some? My computer skills are lacking. Sure thing, Melody. 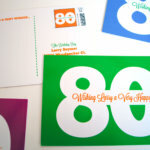 Email me what you’d like the labels to say and I’ll make you a customized set. I printed these to label my brother’s pepper jelly jars and everyone loved them! Thanks so much for posting them, they’re so vibrant and wonderful! Just wanted to say thanks for the free download. I love it that I can personalize my salsa and jam! Prettiest I found online! Thanks for sharing! I’ll be using mine for my Apple Chipotle Chutney. 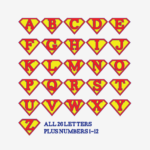 I am going to adapt your template to use it as a label in the inside of some aprons that I am making for my nieces for Christmas – I know it isn’t jam or preserves but I think it will look fantastic and just what I am after. Cute idea, Beeba. I love it! Thanks for the great template. 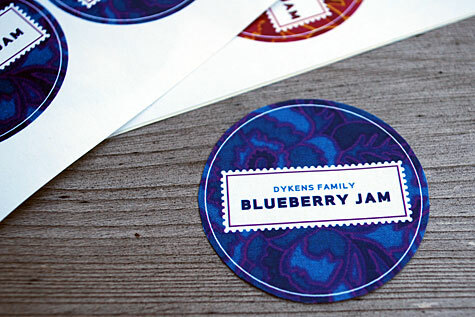 How would I go about ordering a printable sheet w/ the multi-color circles that say “Couderc Family Pomegranate Jam”? Hi Jen, no problem! I can make that printable sheet for your pomegranate jam. I’ll send you an email with details. These are absolutely stunning! 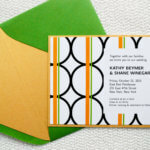 They are so classy and sophisticated and don’t at all have that “clip art” appearance. Thanks for making these for us that are computer graphically challenged! These are gorgeous! Thank you so much for sharing them. I’m using them on my first canning projects: lemon chutney, and mince pie filling. I LOVE these!! Thank you so much for sharing! Supper cute! Having a little trouble getting some of the links to open. Hope I can get it to work soon, I really want these! Hi Amy, did you ever get the template to download? Let me know! I love ur design for the Jams, I am making homemade Mango, Tamarind and Mint/Coriander Chutney, wanted to know how I can custom make with my own logo and name, I liked ur idea of using Sonoma;s designs and re-designing them, Would you be able to share yours with me. I used the blanks to make labels for my homemade syrup. You can see them here if you want! Thanks so much for having this up for use!! Thank you for sharing these! I have been looking for modern labels and could not believe no one had made any. I will be using these for a Ball Canning party I won. I can’t thank you enough!!!! could not for the life of me get these to download! I ended up with 2 pages (one with printed works on them as shown and another with blank labels which is what I wanted!) was not able to print anything or copy and paste it in any way 🙁 they are so cute and I am sitting here with 10 lbs of peaches ready to be canned! Hi Jill, thanks for letting me know. I just emailed you a copy. 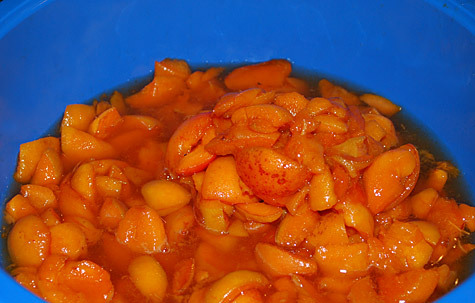 How’d the peaches turn out? Hi there! 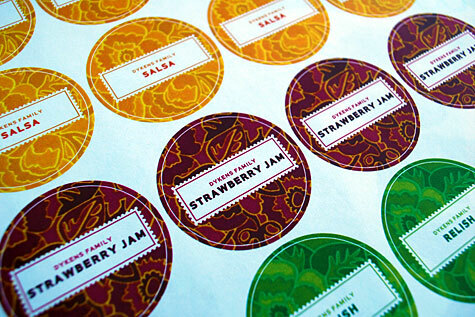 Excited to use your great labels for several canning projects. Could not successfully download the large file – it just was not there. Any suggestions? Thanks! 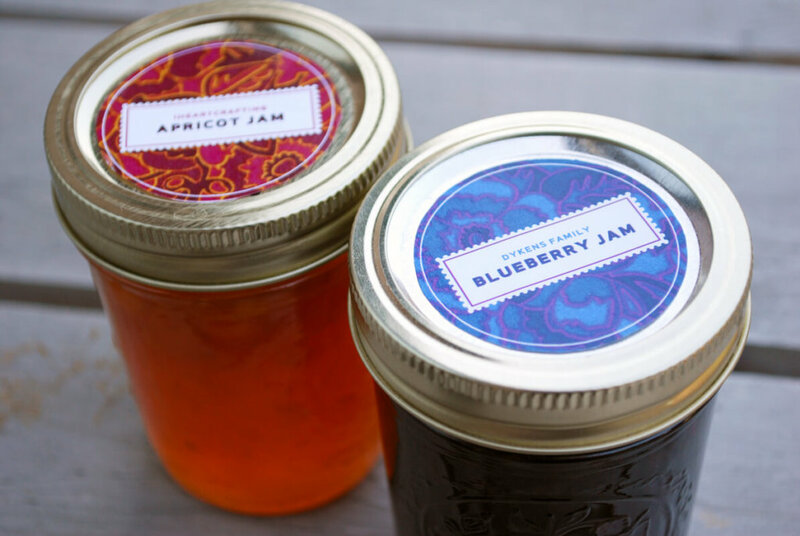 So thrilled that I learned how to edit pdf’s with my mac’s preview…( yeah I am slow and my 65 year old mom had to show me…LOL) Off to print labels for my peach butter and peach peel jelly! thank you! these labels are quite classy looking compared to others….you are very talented….thank you again. Thank you so much for sharing these great labels! They really express the joy I feel in preserving the glorious fruits of summer. Thank you so much! These are awesome! I just made my first batch of pepper jelly with the abundance from the garden. Can’t wait to label them!! Thanks for the adorable canning labels! I used them on my fireweed jelly and they look great. Here’s a link to my blog post. I used these to decorate jams for a friend’s wedding. She wanted jam for her guest’s favors. They were really cute. Thanks so much. It made it much easier having something I could just print off. Hi Connie, so glad that it worked for you! And congrats to your friend. great site! and i hope to use the labels (and make jam). is it hard to make templates? 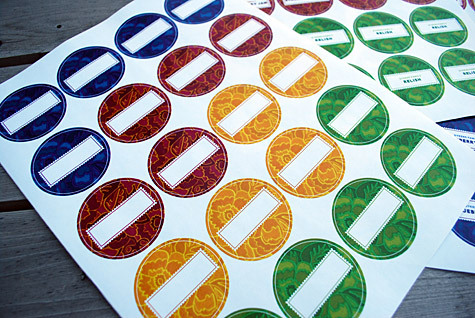 Hi Valeri, you can use the blank ones and write on them if you want a quick label, or you can download a trial version of Adobe Illustrator and make your own. Hardest part will be adjusting the font size and placement if you don’t have the font I used installed. I can always help too – just let me know if you need it. I love these! I am attempting to figure out how to edit these with my mac. (Sometimes I miss my PC and MS publisher) Thank you so much for Sharing these. I have been canning a ton, and now my jars can look cute! I used this template last night to label some watermelon jelly I made for a brunch party favor. Thank you so much! Thank you so much for the great canning labels! My husband likes to make spicy plum sauce and give it away for Christmas. I was tired of tape and sharpie labels so I went web surfing. Your design was a perfect fit! I am also inspired to spend some time designing now. Of course I didn’t think about scanning a favorite piece of fabric and building from there! Thanks again for your designs and inspiration! Staci, that plum sauce sounds delicious. 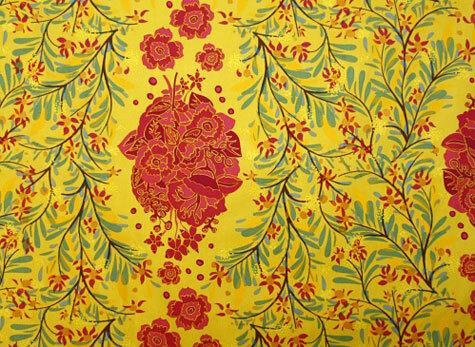 Glad that the fabric scanning sparked some ideas – that’s great! I have a question how did you fill in your shape with your pattern ? and what software did you use I’m trying to make a label as well! thank you so much for your help! Love these!! Thank you for sharing–my canned goods will look so much “fancier” with these labels! @hope thanks for stopping by! Glad you could use them. First-time labels for a first-time canner. Thanks! @R.Kennedy Great! I’m glad that you could use them and I bet your canning turned out yummy. Thanks, Koy, I love that you could use it! Any woman who cans and makes her own labels in a soul sister of mine! Thanks for sharing these templates – I can’t wait till canning season!! Again, thanks. Thanks for these beautiful labels. My Lemon curd and strawberry rhubarb sauce will look even more beautiful dressed up with these. Finally, some good looking canning labels. Love them! Thanks, Cheryl, I totally appreciate it! Thanks, Becca! I really appreciate it and am now following you on twitter – your breakfast bears are adorable. Thank you very much for sharing your beautiful design! I am in the midst of learning to make and can jam for the very first time and the idea of coming up with cute labels was overwhelming me. Now, with your graciousness in sharing your designs, my lovely creations will also have pretty little labels on them all ready for holiday gift giving. Thank you! Great ! Thanks appreciate it alot! Beauties! Hello! Thanks so much for creating these for us! They’re lovely! Now, I just have to learn to make my own design! Wish I knew how to us Photoshop as well as you do! I am a serious novice! Any tips on how you created yours would be greatly appreciated! Thanks again! LOVE these! I will definitely be using them, thanks so much! Thank you. These look perfect. Yeah! 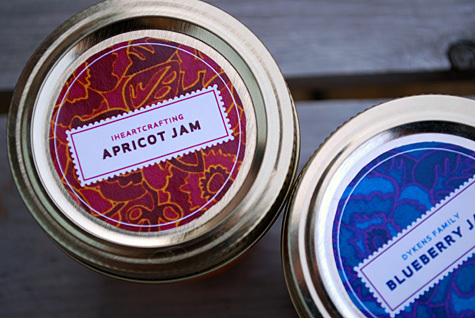 Finally, beautiful preserves, with beautiful labels! Thank you for generously sharing your talent. Thank you for the labels! I love, love, love them. They are the perfect finish to my jams and make great gifts. Thank you so much! I’m going to give these out as Christmas gifts this year to the neighbors! These labels are too cute. Thanks so much for the free template. Have a great day! Hi ! 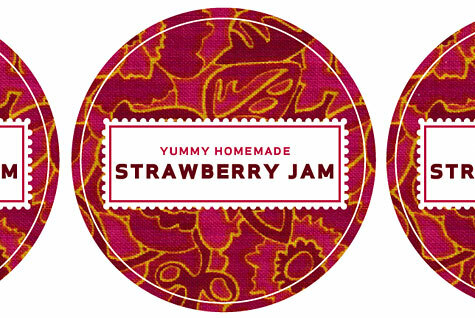 I love your canning labels , and just downloaded a template to adorn my homemade goods with. Thank you ! Thanks so much! You made my life so much easier! Thank you, thank you! I just flat ran out of time to design anything myself, and these are SO much prettier than anything I could find in my small town. I am so happy to have these to add to my christmas gift presentation. Thanks, Laurie, I’m glad that you could use the canning label template. 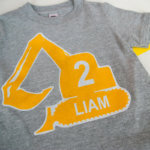 And if you’re feeling in a sharing mood, feel free to post a photo of your creation on the MerrimentDesign.com facebook page (www.facebook.com/merrimentdesign). Merry Christmas! 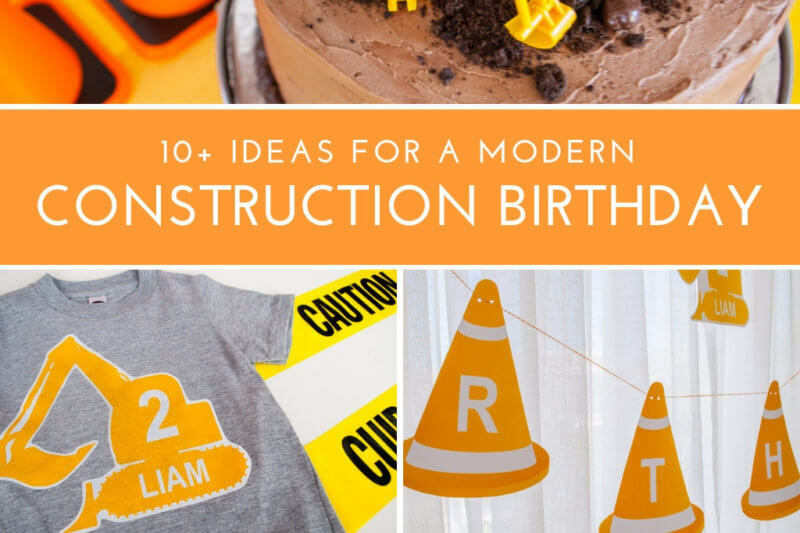 Great printable, I will be pinning this one. They link back to this site to give proper credit, I hope you don’t mind. Thanks! Hi Tina, I used Photoshop and Illustrator. Thanks for stopping by! I love these! I will use this for my pomegranate jelly Christmas gifts. Really love this project, excellent and looks like fun to make. I’m going to give it a try! Thank you, these lables will make my canning look so much nicer and easier to find what i’m looking for at a glance. Paulette, I’m glad you will be using them. Enjoy! directed by the pattern directions. Thanks for the template, I am using it today for a breadfruit preserve!!!! soul mates. Seeking women for marriage at a dating site is convenient in recent years. Thank you, bjmonitas! That makes my day. Glad you can use the labels! Thank you! Needing something to “doll up” some jars of things I’ve canned that I am giving to a silent auction benefit for a sweet little gal with cancer! Thank you so much for these supplies! Perfect for Christmas! Hi i think it’s a great initiative to leave these templates here! I will be using it! Thank you so much!